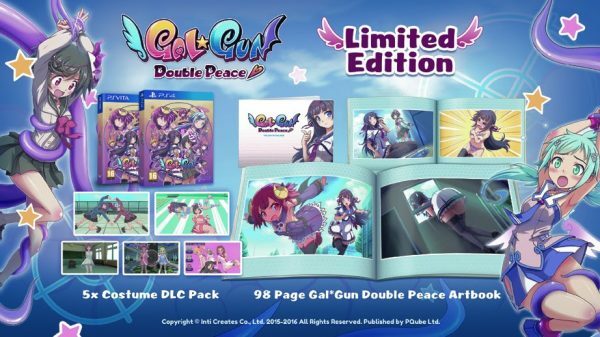 PQube and Inti Creates have announced Gal Gun: Double Peace's release date, and it's dropping July 19 in North America, slightly earlier in Europe on July 15. Gal Gun: Double Peace features Houdai, a young man who finds himself shot by Cupid's arrow. After being shot, he doesn't fall in love as you'd expect with the women around him, but he must avoid waves of women going crazy over wanting to tell him just how much they love him. Armed with a weapon known as a Pheromone Gun, he's got to "deliver" a dose of euphoria to keep the girls at bay. It sounds super bizarre, and it is. You're right. But it also looks like a ton of silly fun. There's a special edition coming out in limited quantities via Rice Digital in both North America and Europe for PS Vita and PlayStation 4: The Mr. Happiness Edition. It comes with a special art book, wall scroll, bonus costume DLC, and a special Mr. Happiness "screen cleaner," which looks like a pair of undies.